Eminem who is known as the “Rap God,” we’ll have to be know as the “Rap Genius” after this album. 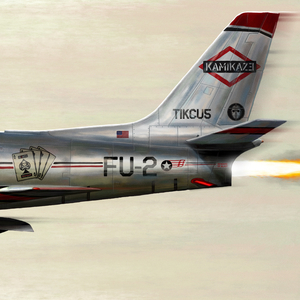 On August 31, 2018, after an 8-month hiatus, without any announcements or any promotion, Rapper Eminem released his tenth studio album Kamikaze. Most noteworthy, is the 13-track project includes production from some of hip-hop’s heavy-hitters such as Mike Will Made It, S1, Fred Ball, Boi 1da and Tay Keith. Even more there are guest appearances from Joyner Lucas, Paul Rosenberg, Royce Da 5’9”, Jessie Reyez and a sampling from Kendrick Lamar’s Humble. Unlike his previous album Revival, Aftermath Entertainment, Interscope Records and Shady Records did not need to draft up a marketing strategy because Eminem’s lyrical attacks against his peers were more than sufficient. Em, opens up the album with his first song titled The Ringer and takes shots at “mumble rappers” Lil Yachty, MGK, Iggy Azalea, Lil Pump, Lil Xan, radio show host Charlemagne the God and his own Shady Records signed artist Joe Budden. In the next track, The Greatest, Em does the unthinkable, he critiques himself before others can critique him. Throughout tracks three to six, Em continues to critiques his last album again and address controversial issues in the current state of hip-hop such as ghost-wristers and excessive drug use. In Stepping Stone, Em opens up to his fan and discusses the rise and fall of Eminem’s rap group D12. He explains how the group dismantled and how the group’s bond was broken after the tragic death of member Proof. Track Eight: Who said I wasn’t on Bad & Boujee? He goes on to say that all today’s rapper sounds the same and suggests that they are all inspired by Dr. Suess. The album continues to follow the same theme; Em is taking even more shot after at artists such as Tyler the Creator and Ja Rule. Tracks eleven and twelve Nice Guy and Good Guy talk about his relationships troubles. The album concludes with the song Venom which is the theme song for the movie Venom. As an Eminem fan, this album is still a bop for me, although I would have like to see Em connect more personally with his fans in his songs rather than connecting lyrical jabs at his opponents. Since his album release, Em has experienced global success, and from the from the looks of it the real Slim Shady is back. If you have not heard it, I recommend you download or stream it now.